"I'm so glad that I found this leg in the second hand shop last Thursday." "It's my only means of support." 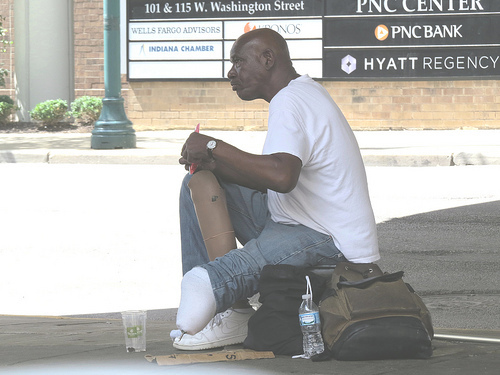 Leroy's prosthetic leg proved to be an excellent place to roll a joint. Police are fooled again by drugs smuggler. Ironically, this tall lad's name is John Silver. "Oops, I put it on the wrong side again!" He lost his leg in a hit and run. To the photographer: "Leggo my ego!" Frank's cardboard sign, "Need a helping hand", was giving mixed messages, so he changed it to "Alms for the poor". "He's not doing any arm"
Bill likes to dream up lines of poetry for his prose-thesis. Hospital bills these days. Costs you an arm and a leg for an x-ray. I'm sorry, I really don't see why I should give money to a beggar who clearly does have a leg to stand on. This photo has got me stumped.